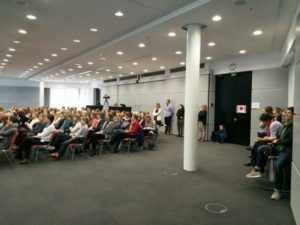 Our first two events 2019 Speed Coaching – Female Finance “Language and Salary Negotiation” and the keynote event “Womanomics” took place in Eschborn with a sensational success! The registrations for our offered Speed Coaching – Female Finance “Language and Salary Negotiation” by the Linguistic Advisory “LUB” were so numerous that Dr. Burel* thankfully agreed to offer the coaching as announced on 27.02.19 and as well on 28.02.19. The colleagues were advised either in our office or via Skype for Business. The resonance was overwhelming throughout! Also the Keynote meeting to the topic Womanomics – successful female positioning in the job in the context of the Gender Week was a full success. The auditorium was very well attended on Wednesday with around 200 employees* and numerous stimulating discussions on the topic followed. An event by Equal Opportunities Commissioner Eschborn in the GIZ Gender Week 2019. Dialoge zu Empowerment am Weltfrauentag: Wie können Migrantinnen und geflüchtete Frauen in der Türkei und Deutschland besser gestärkt werden? #RealGroundbreakers – Get involved in the social media challenge! 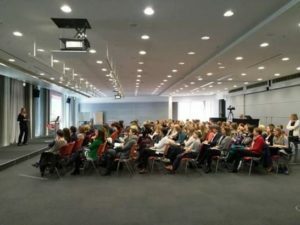 Women for the energy sector: let’s inspire our young generation!